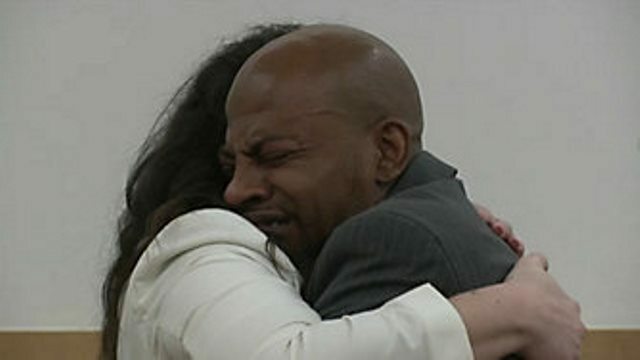 Like a caring mother figure, Judge ShawnDya Simpson held the hands of a tearful John Bunn on Tuesday and fully exonerated him of murder charges. Bunn was only 14 years old when he and another teen were charged and convicted of murdering an off-duty correction officer. Bunn said he did 17 years behind bars for a crime he didn’t commit. An emotional Judge Simpson said the justice system was clearly broken in Bunn’s case. “In one day they picked a jury, they had openings, they had witnesses, and a conclusion on a murder trial which I do not consider justice at all,” Simpson said. A lot of blame for this case falls on the head of disgraced retired NYPD Det. Louis Scarcella. He has been accused of framing dozens of Brooklyn men in the 1990s for crimes they didn’t commit. “The onus had a lot to do with Scarcella, and unfortunately he affected your life and the life of many,” Simpson said.